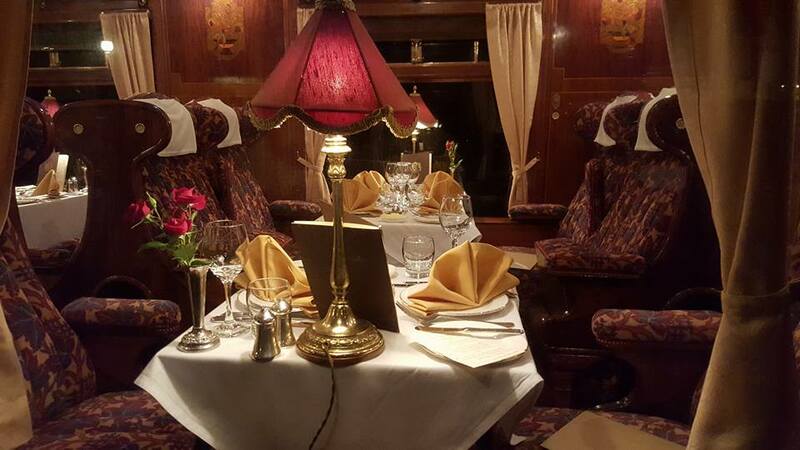 The Bluebell Railway’s Golden Arrow dining train is the perfect setting for a special meal with friends or an intimate evening for two. With Pullman Cars, 'Christine' and 'Fingall' and 1st Class carriage 'Ashdown', the train recreates the fabulous Golden Arrow which once linked London and Paris with the style and panache which made it one of the most glamorous and famous trains in the world. On board you will enjoy fine food and wine served to the standards of yesteryear. 'Christine' and 'Fingall' evoke the heady days of the 1920/30s with their unique wooden wall panel Marquetry and plush seating. 'Ashdown' hails from the 1950s and provides equally comfortable and plush surroundings, being built to convey 1st Class passengers from Waterloo to board Transatlantic liners at Southampton in the glory days of ocean travel. Ticket prices are person and include an your journey (approximately 3 and a half hours for Evening Dinner and 3 hours for Luncheon) and a delicious 3-course meal. A cheese course is available to purchase as an alternative to desert or as an additional course. A cup of tea or coffee at the end of your meal is included in the cost, all other drinks may be purchased and paid for on the train (we regret we currently have no facility to take credit/debit card payments onboard at the moment, but cash and cheques are accepted). Tables for 2, 3 or 4 are available in the 'Christine' and 'Ashdown' and tables for 1, 2, 3 or 4 in 'Fingall'.